ETS DIDACTIC GmbH invests in the location and next generation jobs. 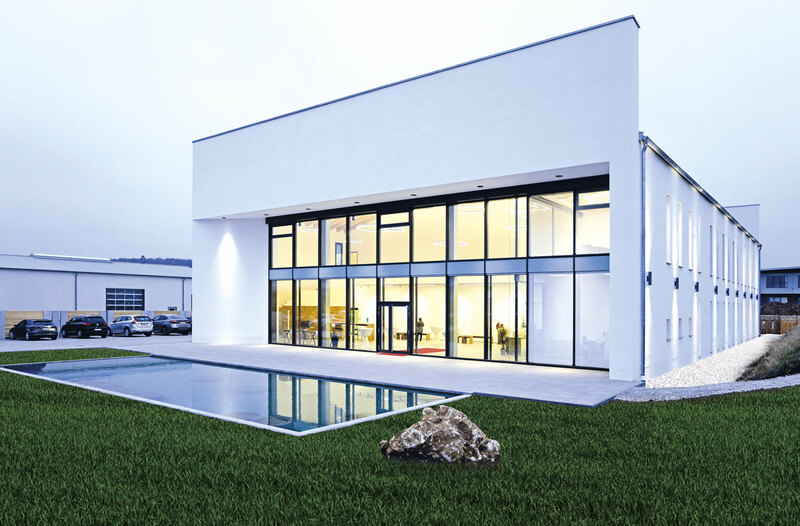 Kinding (lun): After about 15 months of construction, the training center and exhibition building of the ETS DIDACTIC GmbH in Haunstetten was completed and officially opened. It integrates a digital learning factory as an elementary component of tomorrow's vocational training requirements. The new face of the commercial area on the outskirts of Haunstetten is a simple, attractive cube combining regional building culture with cosmopolitanism through skillful use of bricks and glass. Designed by the architect Paulus Eckerle from Titting it was implemented together with the entrepreneur couple Udo and Bärbel Urban and their nephew Sven Urban. The sustainable energy concept in the fully automated building complex allows the operation completely without the use of fossil fuels. The list of trade and repair businesses that built and equipped the building clearly shows the companys regional foothold. In 1997, Udo and Bärbel Urban founded the ETS DIDACTIC GmbH in a Haunstetten estate with the aim of developing training modules for in-house and institutional training and further education for metal and electrical professions. Beside others, the company has specialized in the practical and future-oriented design of training materials in the Industry 4.0 sector. In the new, technically well-equipped training room, based on the curricula, students can learn to handle digital products and gain a great deal of confidence in this field. Bearing Bärbel Urbans signature, the bistro area with its fine wooden furniture and warm atmosphere invites you to recreation and encountering during the training breaks. At its foundation, the company started with only one product, and today there are far over 2,000 products, said Sales Manager Sven Urban. The latest technological developments are now presented in newly equipped exhibition rooms. Together with the range of products, the number of employees has grown to 65 and is still rising. With the expansion of the ETS DIDACTIC GmbH premises, the place Haunstetten had been strengthened and this was of great importance for the 400 residents, said Kinding's Mayoress Rita Böhm. Due to the training facilities, hotels and guesthouses had registered far more than 1,000 overnight stays which was very valuable concerning the hotel and gastronomy industries of the region. The companys products are exported to Asia, the Middle East, Africa and the USA. Nonetheless, the companys grounded and close connection to Haunstetten and the surrounding region was demonstrated through an ammonite representing the landmark of the Altmühltal nature reserve, and that had been found during the construction of the property and handed over to the State Secretary Carolina Trautner by architect Eckerle. Based on a quotation from Aristotle: "Though we cannot change the wind, but put the sails differently", Trautner praised the passionate commitment to the use of technological progress for the qualification of young professionals as well as experienced employees at home and abroad. Ultimately, young talents could be trained to meet tomorrow's labor market requirements. Apart from the State Secretary of the Ministry of Education and Culture, the ceremonial handover of the keys was attended by the Member of Parliament Tanja Schorer-Dremel, the District Councilor Reinhard Eichiner, the District Administrator Anton Knapp, representatives of Kinding´s Local Council as well as more than 100 invited guests. Sven Urban summerized the result of the company's innovative expansion as follows: "Something great has been created here." Picture 1: Various training systems were demonstrated by the employees during a tour through the new building. The State Secretary Cariolina Trautner tested the Mixed Reality glasses used in diverse learning scenarios. Picture 2: The qualification of trainers for the vocational education stands for the company EST DIDACTIG GmbH in the center: Carolina Trautner, State Secretary in the Ministry of Education and Culture (central position), Member of Parliament Tanja Schorer-Dremel, District Councilor Reinhard Eichiner, District Administrator Anton Knapp and Kinding's Mayoress Rita Böhm were interested in the company´s innovaitons and congratulated the entrepreneurs Bärbel and Udo Urban, General Manager Export Sven Urban and his partner Ingrid Nieswand to the attractive training center and exhibition building in Haunstetten.